Six time Academy Award nominee Glenn Close was often seen on Broadway until 1982 when she was cast in her award winning role as Jenny Fields in The World According to Garp (1982) alongside Robin Williams. For this role, a breakthrough in film for Close, she later went on to receive an Academy Award Nomination for Best Supporting Actress. The following year she was cast in the hit comedy The Big Chill (1983) for which she received a second Oscar Nomination, once again for Supporting Actress in the role of Sarah Cooper. In her third film, Close portrayed Iris Gaines a former lover of baseball player Roy Hobbs portrayed by Robert Redford, in one of the greatest sports films of all time, The Natural (1984). For a third and final time, Close was nominated for the Academy Award for Best Supporting Actress. Close went on to star in films like The Stone Boy (1984), Maxie (1985) and Jagged Edge (1985). In 1987 Close was cast in the box office hit Fatal Attraction (1987) for which she portrayed deranged stalker Alex Forrest alongside costars Michael Douglas and Anne Archer. For this role she was nominated for the Academy Award and Golden Globe for Best Actress. The following year Close stared in the Oscar Winning Drama Dangerous Liaisons (1988) for which she portrayed one of the most classic roles of all time as Marquise Isabelle de Merteuil, starring alongside John Malkovich and Michelle Pfeiffer. For this role she was nominated once again for the Academy Award and BAFTA Film Award for Best Actress. Close just wrapped the final and fifth season on the hit Drama series Damages (2007) for which she has won a Golden Globe Award and two Emmy Awards. In her career Close has been Oscar nominated five times, has won three Tonys, an Obie, three Emmys, two Golden Globes and a Screen Actors Guild Award. In 2009, Close founded Bring Change 2 Mind, an organization aimed to emerge as the world's most effective organization working to end the stigma and discrimination surrounding mental illness through widely distributed Public Education Materials based on the latest scientific insights and measured for effectiveness. BC2M also acts as a portal to a broad coalition of organizations that provide service, screening, information, support and treatment of mental illness. As part of a national anti-stigma campaign Ms. Close worked with The Balanced Mind Foundation, Fountain House, and Garen & Shari Staglin of the International Mental Health Research Organization (IMHRO) to remove misconceptions about mental illness. She works closely with both her sister, Jessie Close, and nephew, Calen Pick, who both live with serious mental illness. 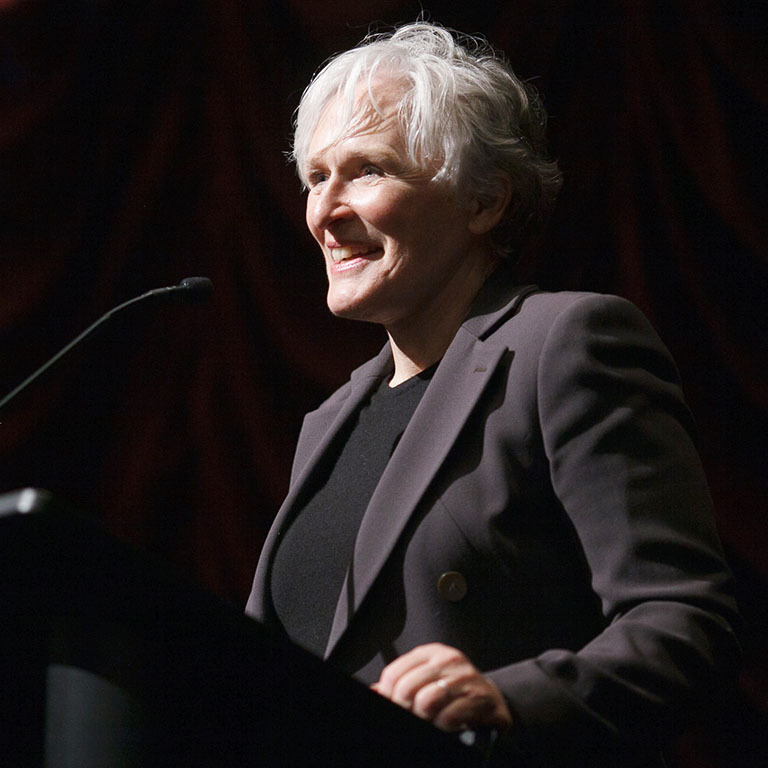 Glenn Close sits in the IU Cinema. Glenn Close sits on a bench in front of IU Cinema. Glenn Close on stage at IU Cinema. Glenn Close talks with guest in the lobby of IU Cinema. Glenn Close on stage with Indiana university Faculty at IU Cinema.